The central, elevated and often most important settlement of the island, for examples see the photos of Kythira Chora, Milos Chora and Sikinos Chora further below. The port that is associated with the (highest) Chora. From the Italian word “scala” (stairs), as can be found on Santorini, Patmos, Astypalea and Sikinos. Skala is also used to indicate a quay on nautical charts. This place name refers to a thermal spring - Loutraki - hence indicating “spa” or “baths”: Methana: marvellously mephitic , Kythnos, Skopelos. From the Greek word meaning “deep” or “depth” indicating a “deep harbour”. See Meganisi, Methana, Samos, Kalimnos. Litterally “whole harbour”, suggesting a good place to moor. Examples on Mykonos, Astypalaia, Tinos, Skopelos and Naxos. The greek word for “castle”, compare the Latin “castrum”. Usually referring to Venetian castles or (a part of) a town that originated from such a fortress. Examples on Skiathos, Sifnos, Andros. Also, Chios, the main settlement on Chios island, is often called either Chora or Kastro to distinguish between the island and the town, likewise Antiparos. The highest mountain on numerous islands, notably on Melos, Rhodes and Sifnos, is named “The prophet Elias”. Also Panayia or Panaghia, meaning All Holy. One of the titles of Mary, the mother of Jesus, used throughout Greece for Orthodox Churches, villages and bays, as on Pelagos. After medieval Greek mandrakia, plural of mandrakion “yard”, a diminutive of mandra “enclosure”. It may also be a topographic name for someone living by an enclosure. Mandraki is a common place name in Greece, and Mandrakis is also found as a Greek family name. Notably: Mandraki port on Nisyros, Mandraki (the old harbour) on Rhodes, Mandraki port on Corfu, Mandraki anchorage on Hydra. from ἄρχι (chief) and πέλαγος (sea), which was the proper name for the Aegean Sea and later the Aegean Islands ! The ancient route via the legendary south coast of the Peloponnese. This meridional coastline of the Peloponnese is relatively pristine and off the beaten track, in great contrast to the touristed Corinthian Gulf. The three promontories frame two large gulfs – Messiniakos Kolpos & Lakonikos Kolpos – with greatly enriches this cruising ground. Katakolon (visit the archaeological site of Olympia), Kyparissia, Marathopoli, Pylos, Methoni, Koroni, Petalidi, Kalamata, Limeni, Mezapos, Porto Kagio, Gytheio, Plitra, Elafonisos, Voie (Neapoli), Kythira - rounding cape Malea thus leaving now officially the south Ionian and entering the Aegean and turning north again - Monemvasia, Gerakas, Kiparisi, Leonidio thus ultimately arriving in the Argolic Gulf. Kyllini, Messolonghi (Mesolonghi), Patras, Nafpaktos, Trizonia, Kallithea, Galaxidi and Itea; and although usually teeming with tourists, be sure to visit the archaeological site of Delphi from either of the latter two ports. The archaeological sites: the Temple of Apollo Epicurius (World Heritage) in Bassae northeast of Kyparissia, the ancient town of Messene near Kalamata, the archaeological Site of Mystras (World Heritage) between Kalamata and old Sparta, the medieval fortress-town of Monemvasia (mone and emvassia = “single entrance”), the ancient Greek Sanctuary of Olympia, the palace of Nestor in Pylos, and of course Argos, Nafplion and the beautiful Mycenaean fortified settlement of Tiryns near Nauplion / Nafplion. This is the historic route – after all, the Corinth Canal is quite recent: 1893 – hence the wealth of fortresses built by the Venetians, Turks, etc. to defend this vital part of the trade route that brought pepper, gems, silk, pearls and opium to Europe. The trip through the Corinth Canal is expensive and involves a lot of waiting - first time though the trip through the canal is an event and arguably the recent built Rio-Antirio bridge near Patras is a formidable sight too, especially at night when it is colourfully lit. The gulfs of Patras and Corinth suffer from a lot of commercial shipping. The Lefkas → Athens trip is much longer via the Southern route with roughly 295 nm , compared to the mere 178 nm via the Corinth Canal. Furthermore, exploring the rewarding Gulfs of Messiniakos & Lakonikos would mean an additional 50 nm. If you have only seven or 10 days to sail the yacht from the Ionian towards the Argo-Saronic: Zakynthos - Katakolon - Methoni - Koroni - Porto Kagio - Elafonisos - Monemvasia - Hydra - Athens, but ideally you should allow at least two weeks. The southern coast is advanced sailing ground and especially the waters near cape Malea can be treacherous. The northern route - although often suffering from light winds - is much easier. Sometimes it is not possible (due to insurance) to take a charter yacht along the southern route - check this in advance with your charter agent! In the summer months the prevailing winds are from the North West, which hinder the passage from cape Malea to Katakolon (mostly in the afternoon when the winds develop). The opposite direction is of course aided by these same winds. Water shortage along the (southern) coasts of the Peloponese and virtually no water at all for yachts between Kalamata and Gythion means bringing water in - preferably large - tanks, while keeping a parsimonious eye on the water tank levels. Conclusion: For the experienced sailor the southern passage is definitely worth the 2 or 3 weeks it takes to explore and relish these sequestered shores. Yet, the prevailing winds make the Ionian → Aegean direction much easier than vice versa. Moreover, rounding Cape Malea can be extra difficult during the Meltemi season. Because of Latin transliteration and even modern Greek pronunciation, two unconnected regions seem related: the Ionia (Ionian - İyonya) in Turkey and the Ionian in Greece. However, Greek spelling distinguishes between Ιόνια referring to the Ionian sea and islands in Greece and Ιωνία (with an omega instead of an omicron) referring to the coast in Asia Minor. It was Aeschylus who clarified that the Ionian sea was named after the beautiful priestess Io, who caught the philandering eye of Zeus. When Zeus' wife Hera was about to catch the couple in flagrante delicto, the god changed the girl into a heifer . Yet, Hera was not to be deceived and claimed the heifer as a present which she guarded with the efficient help of Argus, the insomniac giant with hundred eyes. When Hermes, working for Zeus, charmed Argus to sleep and killed him, Io the heifer escaped only to be persued by a terrible stinging gadfly sent by Hera. The first place Io fled to took her name - the Ionian sea - before she ended her bovine swimming marathon in Egypt, where Zeus restored the girl to her rightful form. As for the unfortunate Argus, Hera collected his hundred eyes and stuck them on the peacock's tail. In contrast, the Ionian coast in Turkey was named after Apollo's son Ion; the mythical founder of the Ionian race. Finally, the adjective Ionian should be used for the Greek islands and sea, whereas the adjective Ionic should be used for the Anatolian region east of Chios and Samos, which features the ports of İzmir, Çeşme, Kuşadası and Güllük and the archaeological sites of Ephesus, Teos and Didyma. 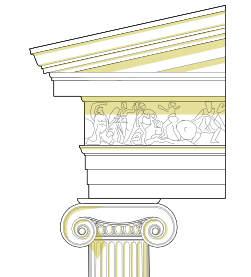 Interestingly, for the Ionic order in architecture the proper adjective is used, yet not for the Ionian League, the very culture that developed this style. Indeed, most yachtsmen use the term “Ionian coast” to describe this northernmost part of the Turkish Riviera. Sailing Greece is done out of the following yacht charter bases that are listed below in descending order of importance. 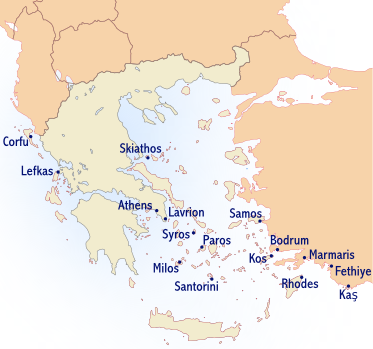 Note the Aegean diagonal from Athens to Rhodes around which the majority of yacht charters takes place. Usually the cheapest and most available flights are to Athens International Airport, which is close to both Lavrion and the Athens Alimos marina at Kalamaki. The other yacht charter bases in the list above are more difficult to reach by direct flights, so domestic flights and of course the ubiquitous Greek ferries will add to the logistics. A list of Aegean islands and their ancient Greek, Greek, Latin, Turkish and Italian names.